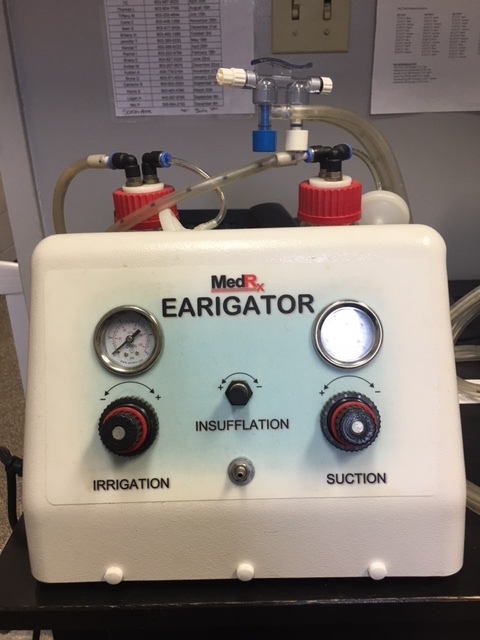 The EARIGATOR is an ear cleansing instrument that draws water from a reservoir through a hand piece and nozzle at a controlled temperature, pressure and flow rate. In addition, a custom catch basin provides water overflow collection. The instrument has five main components: a control unit, a reservoir, a heater assembly, a hand piece assembly and a water delivery system. Combines the functions of otoscope and irrigation into one. Complete automatic control of water pressure at 12 +/- 2 PSI, which is safe for the ear drum. Equipment is readily available for immediate use without time consuming preparation. The procedure requires only one person in contrast to the syringe method which requires two. The procedure can be completed in three to five minutes rather than the current method requiring at least 10 to 15 minutes. Disposable tip eliminates the need for sterilization. The EARIGATOR is simple to use and fail safe. Only limited instruction of non-physician personnel is required. EARIGATOR has been extremely reliable and have needed little to no maintenance. To find out more about the EARIGATOR, call us today at (888) 485-5452 or contact us online.